Note June 2016: LOL! Never took pictures of the Goldenrod dyeing and have yet to dye with the Ivy. But, I am posting anyway! Note on January 2013: I know why this one sat in draft. I never finished writing it. I think that this is the one that caused me to throw up my hands in despair and evoke McKayla disaproves. So this is take 2. September 2012: What do carrot tops, ivy leaves, and goldenrod have in common? 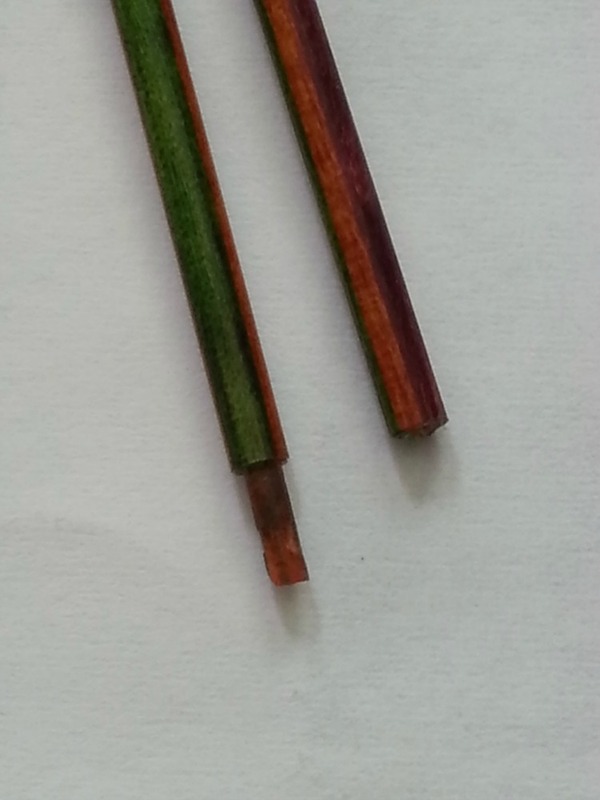 They can be used to dye fiber! 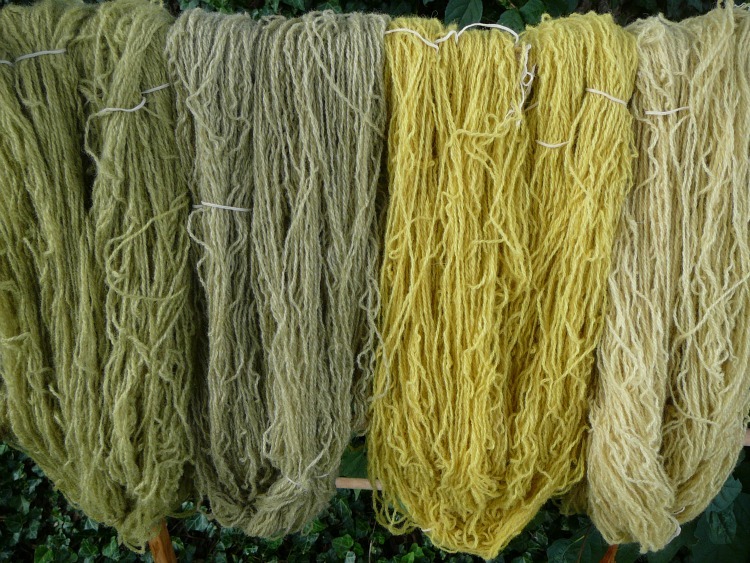 I’ve gotten my dyeing mojo going right now, and I’m talking about the slow, natural dyeing mojo. and scoured them (that just means I washed them to get the spinning oils off, but it sounds so dramatic to say I scoured them). They are now dry. Though I do intend to dye with the flowers and leaves in my garden, first I wanted to start with the carrots. So, Friday afternoon I pulled the leafy green part off 4 bunches of fresh, organic carrots. 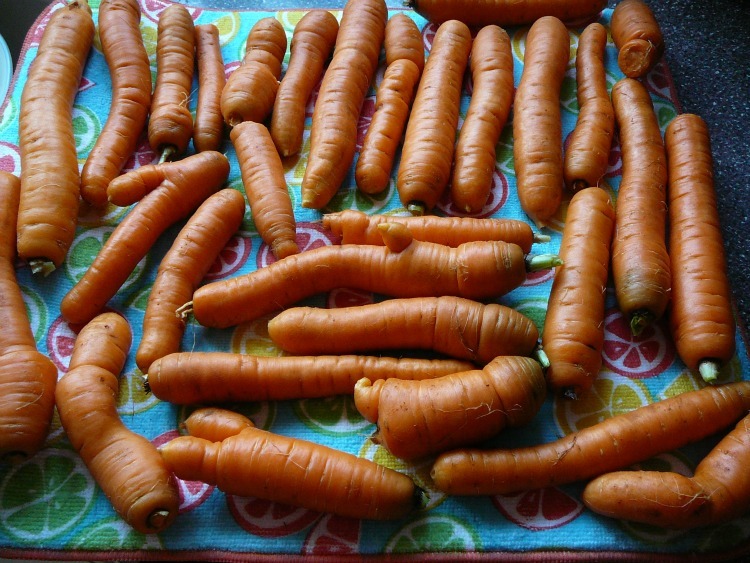 Carrots – don’t they look great! 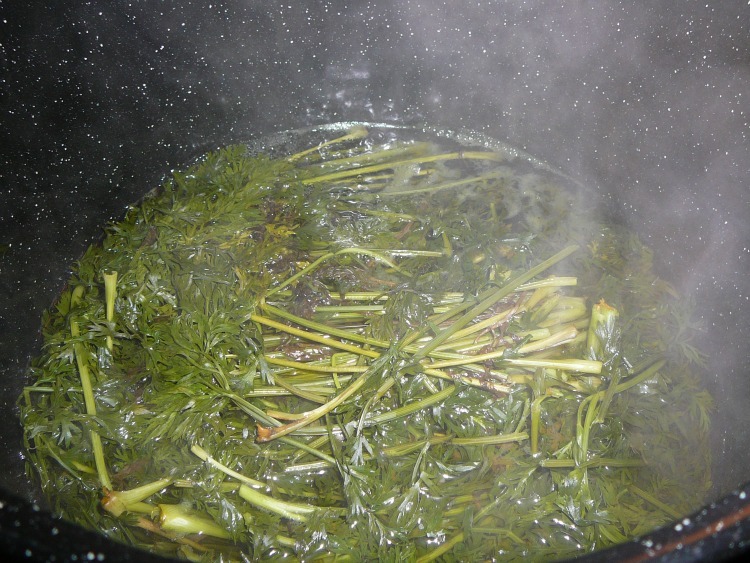 I rinsed the leafy parts and put them into a pot of water to boil, then simmered them for about an hour. I left it to cool in the pot. Once it was cool, I strained the liquid and put it into an empty gallon water jug. Alas, I took no pictures of the dye liquid, but it was a pale green. I was originally going to dye 3 skeins, but reconsidered, and went with 4 skeins. 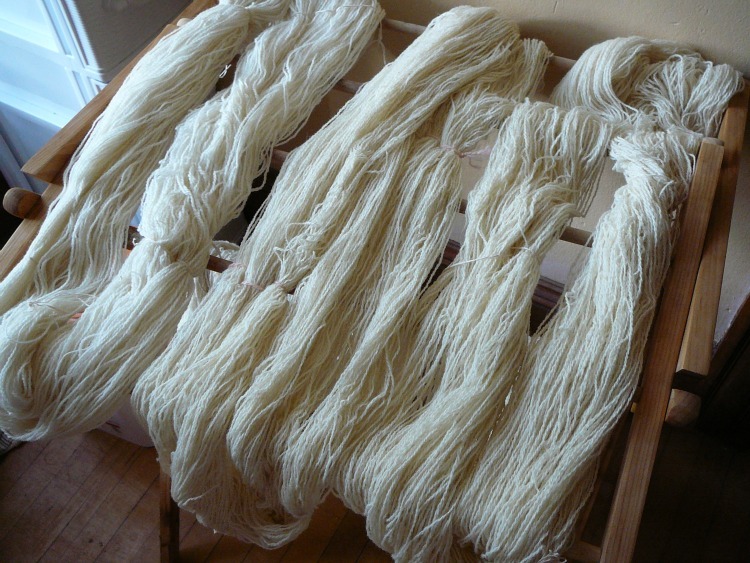 I had used about 12 ounces of carrot tops and 4 skeins would equal that in weight. But first I needed to use mordant on two of the skeins. See my intention was to dye two skeins without mordant and two that had been pre-mordanted with Alum. Once they were all dyed, I was going to take one of the un-mordanted skeins and one of the mordanted skeins and put them back in the dye bath, but this time with an after-mordant of Iron. 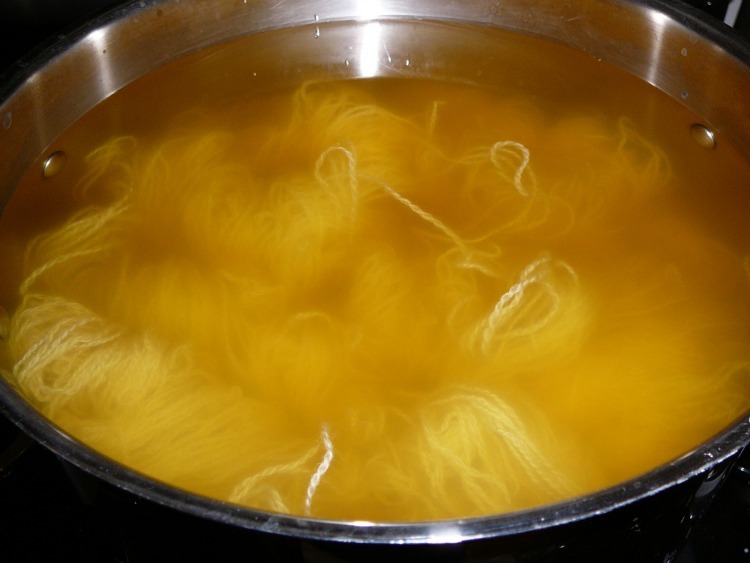 I think that once they had finished simmering, I let them cool in the dyepot. I like to do that, to get the maximum color I can get out of the dye. It’s is surprising to see that what were green carrot tops is showing as yellow in the pot. That seems to be the way it is with plant materials. As I mentioned earlier, two of those skeins later went into a pot with an iron mordant. I don’t seem to have a picture of that. Left to right: Alum mordant, alum mordant followed by Iron mordant, no mordant, no mordant followed by Iron mordant. 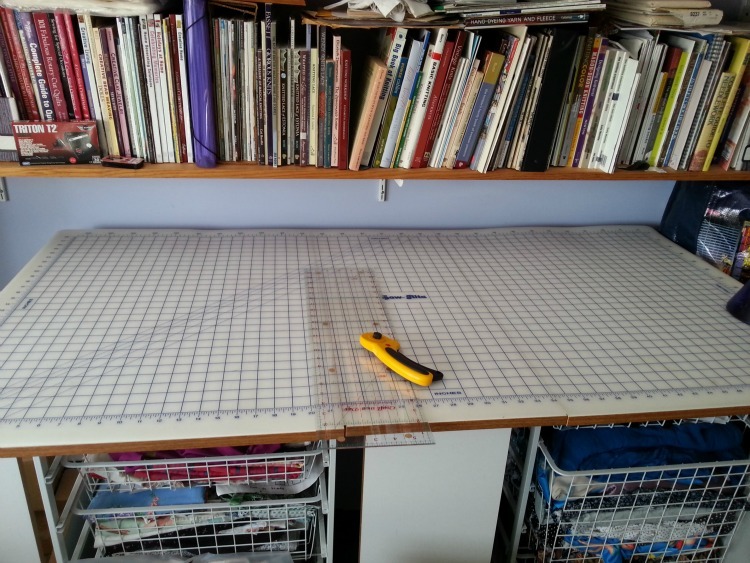 So I entered into the sewing room and examined my cutting table. Not too bad, just a few things to move off of it. Ta Da! Like magic; all cleared off and ready for cutting! Ha! I wish it were that easy, though as far as clutter goes this wasn’t really that big a chore. I mostly had to reshelf a few books and move a few ‘in progress’ projects off the table. When I got home after purchasing the fabric, I cut out little squares and pinned them to a photo copy of the pattern page with the fabric requirements on it. I was so proud of myself for doing that! 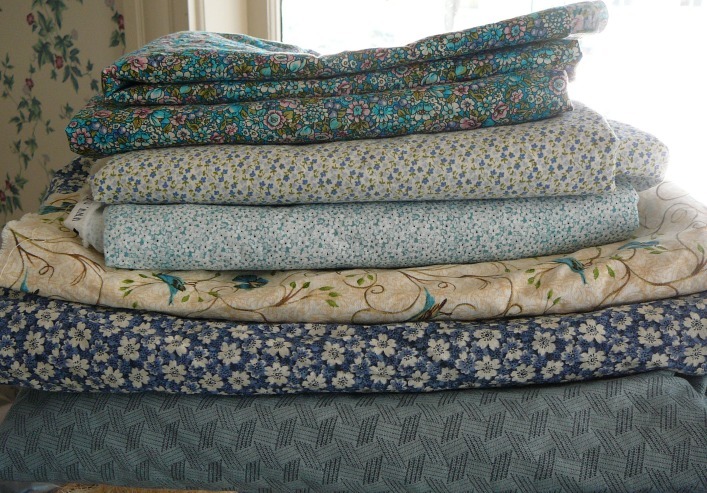 But, of course, now I notice that I never indicated which fabrics were going to be which border and I no longer remember what was which. I started to cut the strips, trying to guess what my thoughts had been regarding the borders back when I bought the fabric. 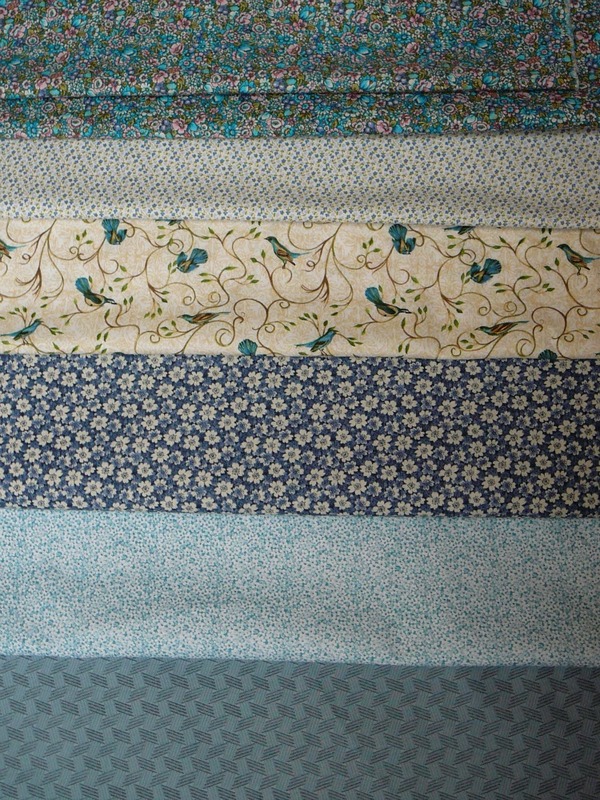 After coming up one strip short on the fabric that I ‘guessed’ was going to be the first border, I decided to concentrate on the squares and cut the borders later. It was interesting cutting them. When I started there was one thread, every few inches, on the bottom layer of fabric that was not cutting. I decided that my rotary cutter needed a new blade (this was not a new problem, I had just lived with it). But I started to have the same exact problem with the brand new blade. So I fiddled with the angle that I held the cutter and discovered that if I held it upright (vertical, rather than parallel to the surface) I had no problems and I had less slippage of the ruler as well! Well, I’m almost ready to start sewing now, but it will have to wait until this coming weekend. Slight change in direction here. Here’s the fabric, all ironed and ready to be cut, hanging from a banister at the top of the stairs (I love those stairs!). 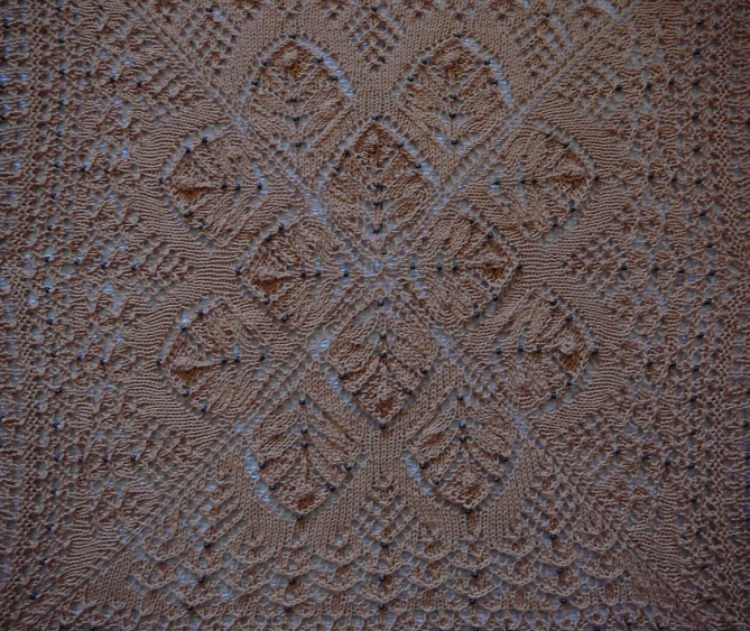 I chose to use Eleanor Burns’ book: Quilt in a Day: Log Cabin Pattern and make the quilt in her standard twin size coverlet size. She recommends batting sized 67″ x 95″, but the pre-cut twin size batting at Joann’s, where I purchased it from, was smaller than that, so I ended up buying the full size at 81″ x 96″ (after all, it was 40% off, so it’s worth the little extra time it’s going to take me to cut off a few inches on the sides). About those stairs; they are perfect for working with long pieces of fabric. Pictures show it better than I can explain. 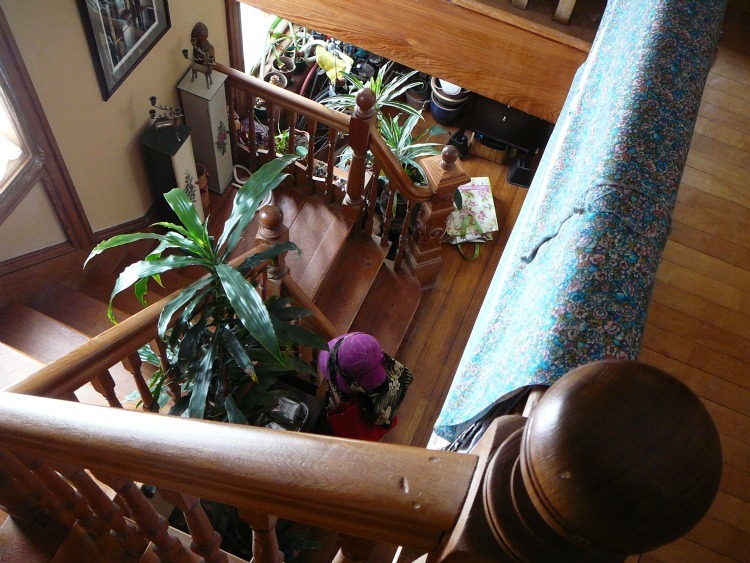 View from the top of the stairs (where the fabric is currently hanging). I can stand in the hallway at the top of the stairs (to your right in the picture) and hang long pieces of fabric over the edge. It makes it easier to even up the edges of those long pieces and easier to fold them. I’ve also hung twisted yarn over the edge to let it untwist. 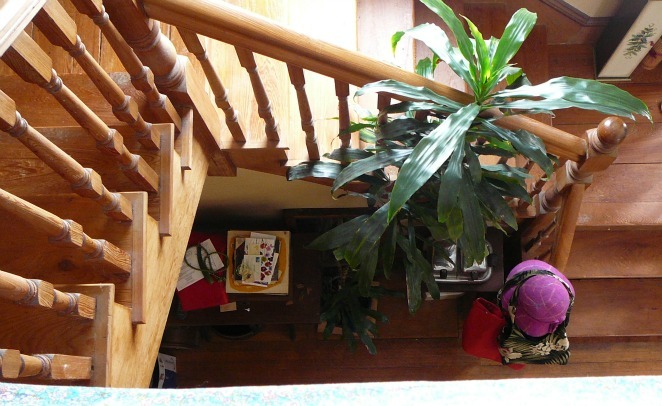 Maybe I should compile a list of 101 uses of open stairways, I have two so far! Next step on the quilt? 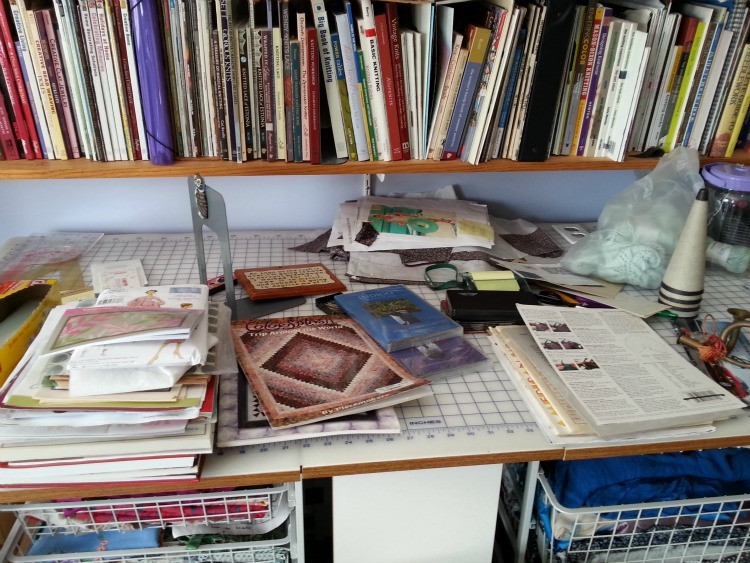 Cut the strips, but first I need to clear space on my cutting table (those of you with immaculate cutting tables: hush). 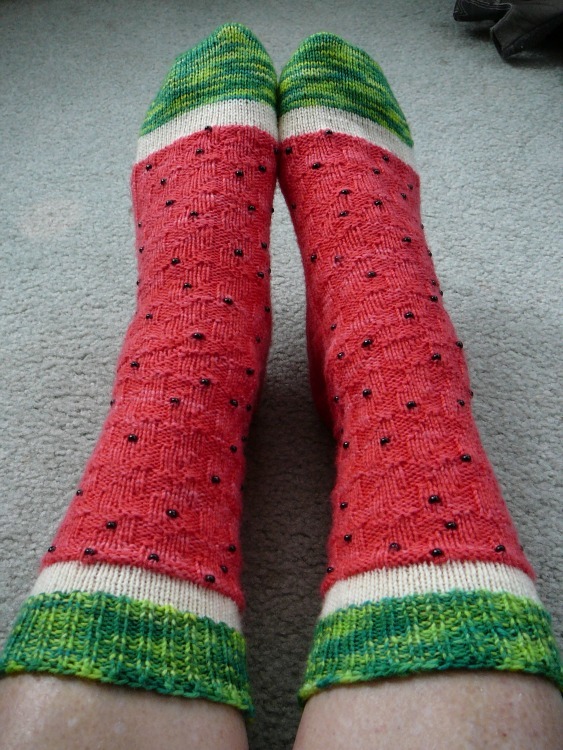 So, a few hours after I proudly took the pictures of my finished Watermelon Slice socks, I took them off my feet. Then, to my horror and dismay, I found a big, fat booboo! I had somehow dropped a stitch around the heel. I’ve since picked up the stitch and brought it to the point where I probably dropped it. These socks have been bound off, so if possible I want to fix it right at the heel, but I don’t want to add a lot of bulk to the heel as a result. 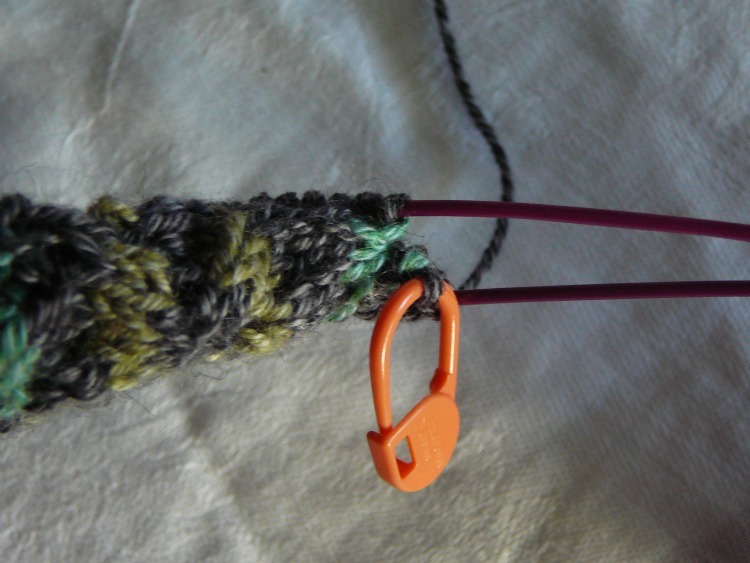 Every article I’ve found on the internet assumes you catch the mistake while you are still knitting. I’m at a loss, any suggestions? I finished the Watermelon Slice Socks and there’s still snow on the ground! In fact we are having flurries today. I love that word ‘flurries’ and I love watching ‘flurries’. They give everything a nice, clean, white coating and look way more serious than they really are! Strangely, they are making me hungry?! Now on to finishing the second Cardioid and the last of my July projects…Which is good because I’m itching to start a new project or two. 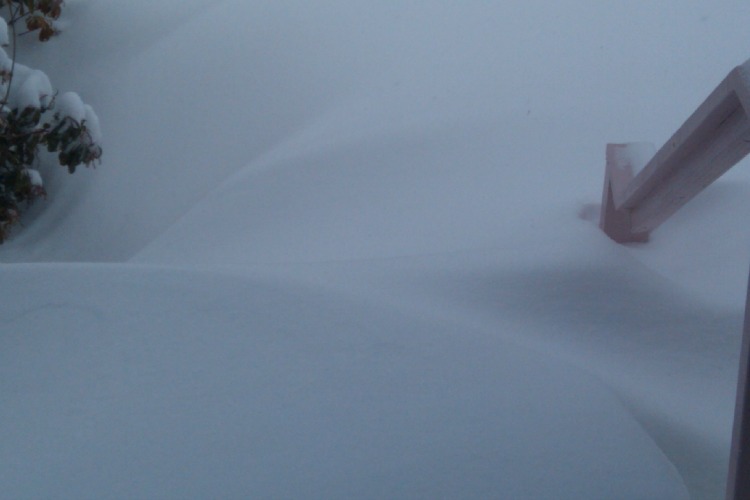 but Nemo, the storm that hit the Northeast on Friday and continued to rage during the day on Saturday. 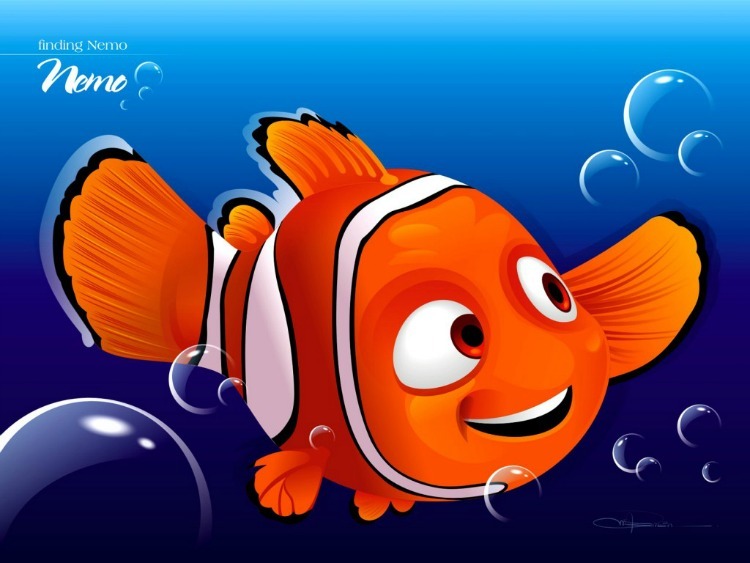 Nemo, however, is not an official name. The government never names these kinds of storms, but the Weather Channel decided to give it a name. So, after much thought, they came up with Nemo. Here we were, Sunday, a beautiful sunny day – the temps went above freezing into the upper 30s. 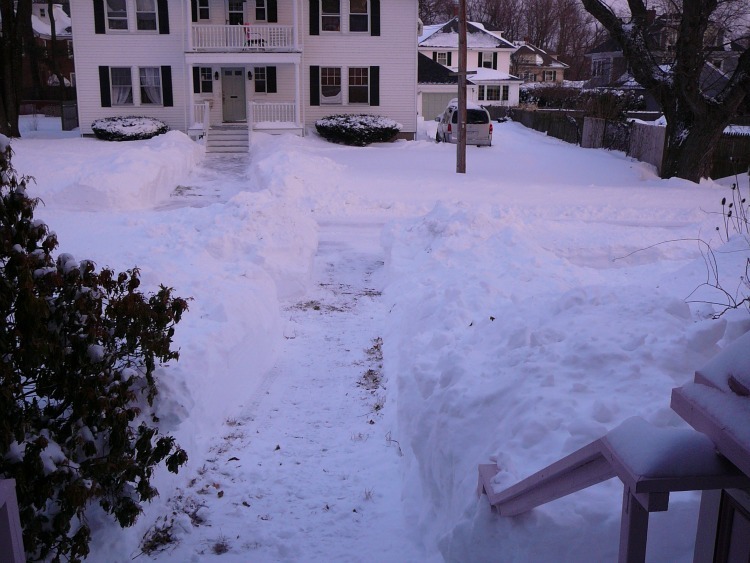 Oh here are the front steps and the walk way after we cleared the snow (listen to me saying ‘we’, actually DH did all the shoveling. 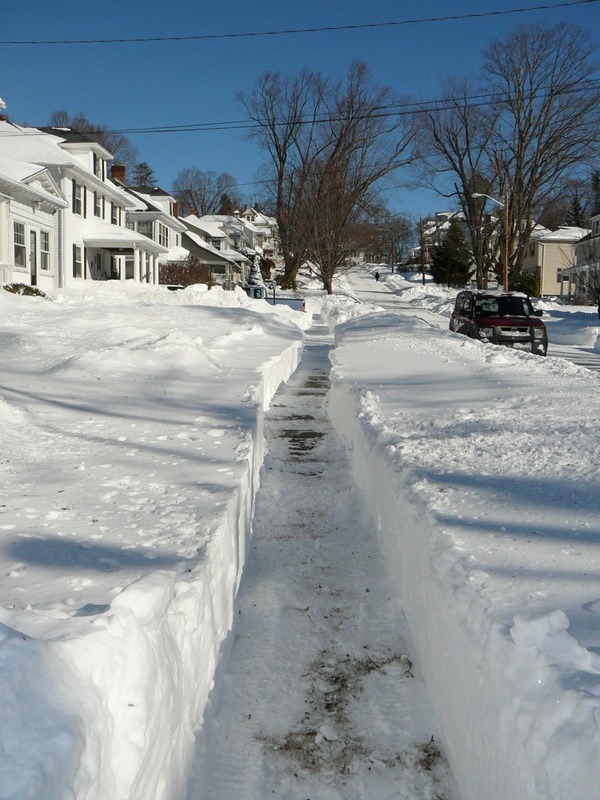 A neighbor did come by with his snow blower and help in the driveway a bit). You’d think I spent my time productively and did a lot of knitting, right? Well, I did spend the time productively, but not knitting, at least not all the time. I decided to tinker with my laptop and get it set for doing taxes. I fixed the problem with the communication with the wireless printer. I downloaded software for a few states that I’ll need during the tax season and brought the Federal tax program up to date. Finally, I got a good chunk of my own taxes done. Before I knew it the day was over. Near the end of the cuff. And then I had a terrible, awful needle mishap. I, as you can see, use two circulars to do two socks at a time. I was pulling one (the wooden one) through when I finished with a ‘row’ and it disconnected. 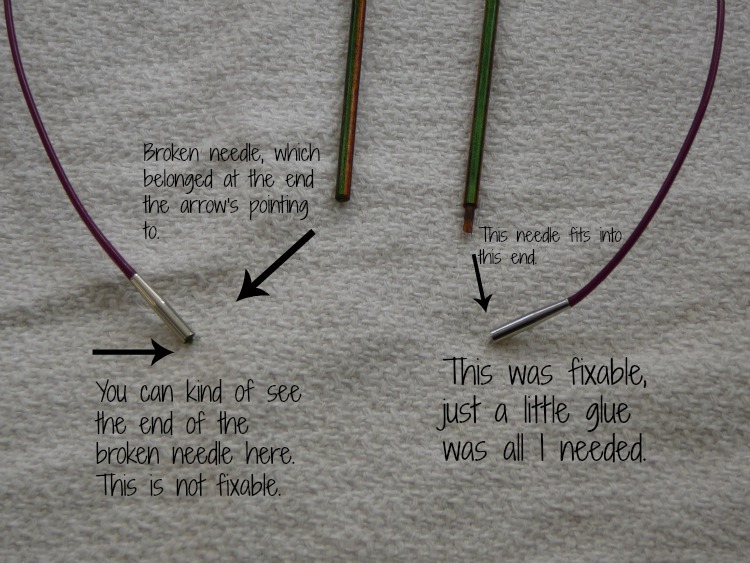 Now, mind you the needles are not designed to disconnect. So I decided, that since I had another, though shorter (16 inch), circular in the same size (2.50 mm, or size 1-1/2) I would use that for one sock and the defective circular for the other sock. I still had the one circular with the chrome finish going through both socks. So now I was knitting 2 socks with 3 circular needles! Despite that, the needle pulled apart again! I guess I should have glued it. So, as I picked up all the stitches, I pondered my fate. Should I replace the needle (that is buy a new one)? Or try to fix it? It was something that could be glued, but what glue to use? My knitting was sitting on my lap and, as luck would have it, I managed to put just the right amount of pressure on my knitting to hear ‘snap’! The other needle, at the other end of the circular, had broken off right where it joins the circular. So, sigh, my 16 inch circular is now doing double duty and I definitely have to order a new needle. I finished the white portion of the cuff, now unto the green. 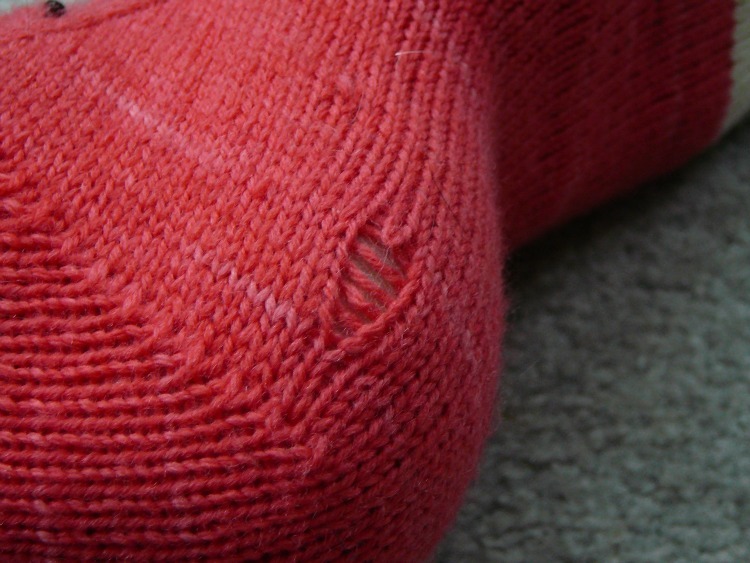 I should have a new pair of socks by the end of the week. I am very curious to ‘feel’ what they are like to wear, what with all the beads; though I do tend to wear my hand knit socks with crocks which are nice and loose. Once I’m done with these I will work on finishing the last of my 3 July projects (or should I say, then I’ll be ‘two down and one to go’)! 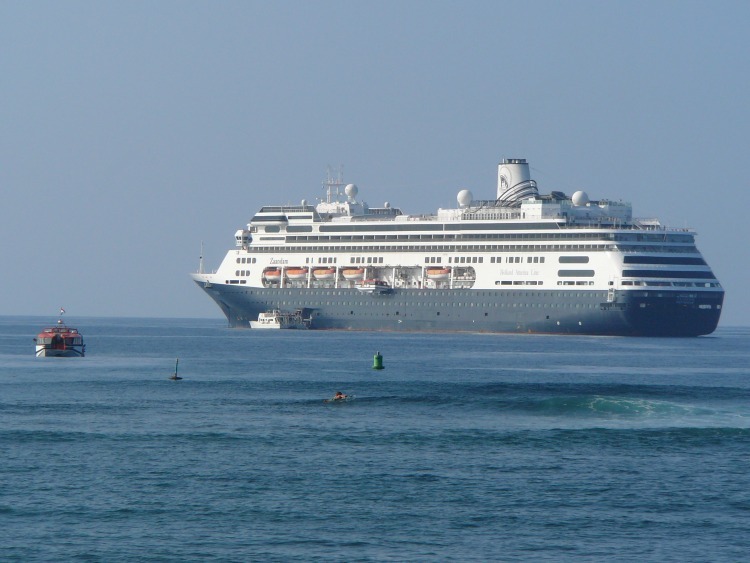 As promised, I am going to talk about that cruise. My mother-in-law likes to cruise and she likes to take her kids and their spouses on cruises with her when she hits milestone birthdays. Her 85th birthday was exactly that! 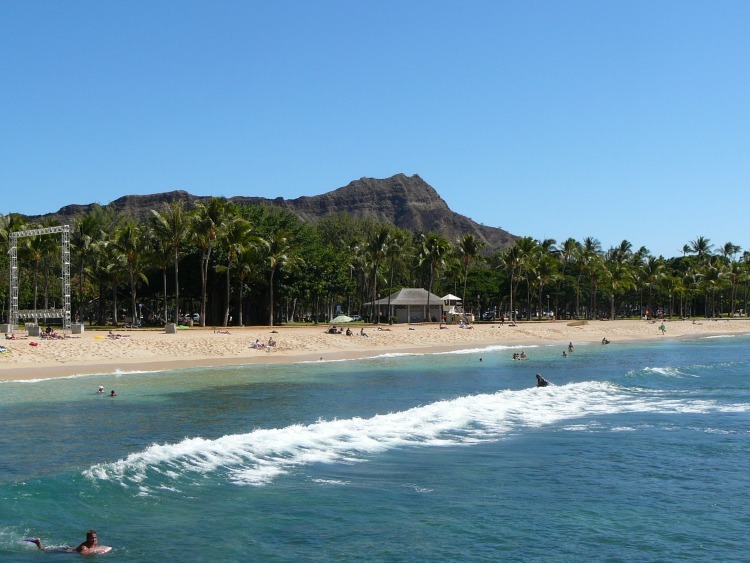 So she took us all on a cruise to Hawaii and back again. Now, a while back I had asked her if she would prefer a pair of hand knitted socks for her birthday or a shawl. She lives in Florida, so she nixed the socks. 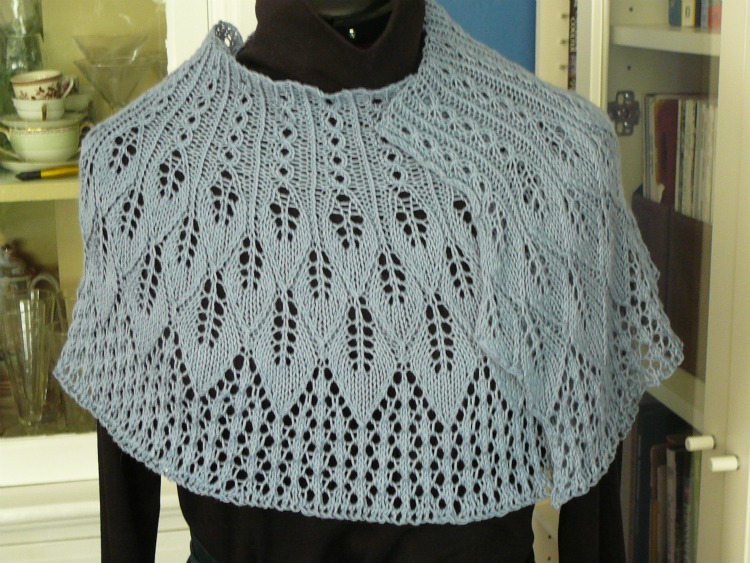 After searching through the shawl patterns, I settled on Tibetan Clouds Beaded Stole. Again, keeping in mind that she lives in Florida, I went searching for an adequate yarn. I found Lyndon Hill, which is a combination of cotton and silk, perfect for Florida! Alas, it is a discontinued yarn, but I found enough on eBay, and in a great color to boot. So, as is my habit, I purchased one more skein then I thought I would need (I’m always grateful that I choose to buy the extra skein). Then I searched and searched and searched for just the right color beads. Finally I found them online and ordered them. So by mid July I had all the materials and was ready to start. I checked Ravelry and it seems that I had a lot of projects that I started in July; 3 to be exact. One I just finished last week, and the other two still need to go. Like I said, all materials were set and on hand. Now here is where I end up wondering what’s going on in my head. My MIL’s birthday is on October 31, so we were flying off to San Diego on the 26th of October. 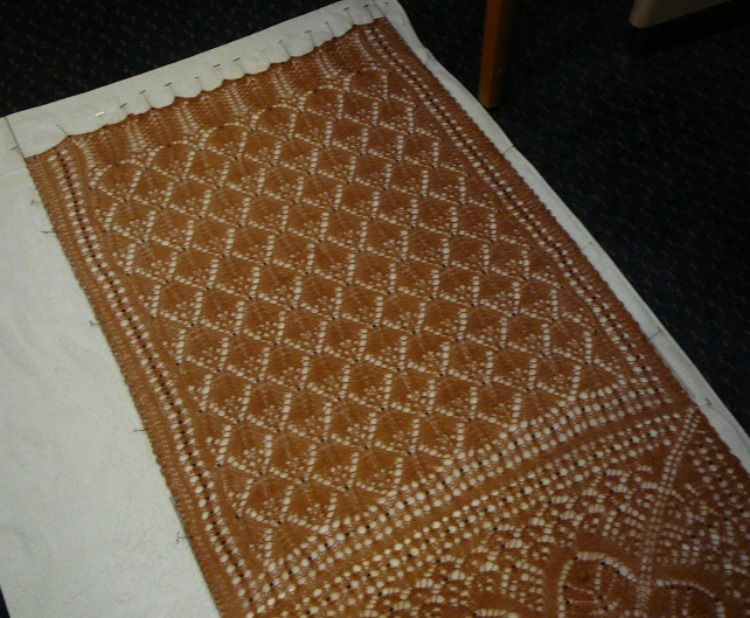 I knew about this for over 6 months, I had all the materials for over two months, yet, I started to knit the shawl on September 23rd. 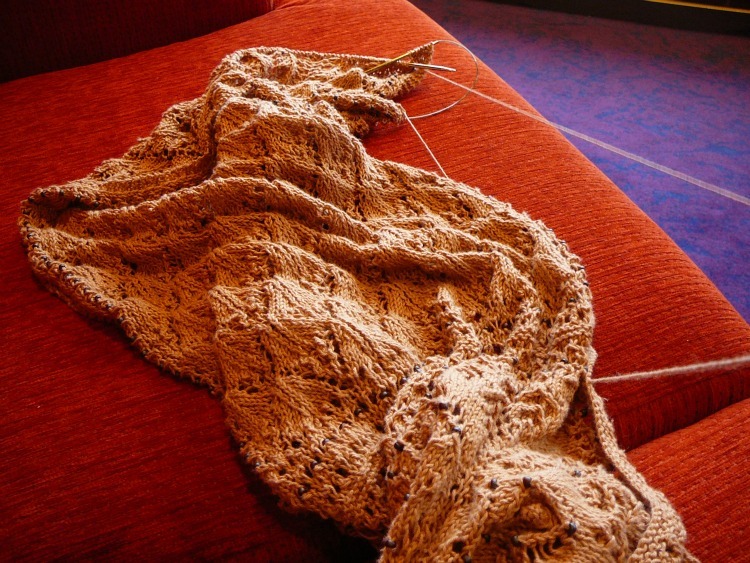 One month to knit the shawl. So, I sat down and put together a schedule. Ambitious, but I felt it was doable. This shawl starts in the middle and makes the center square circular – let me clarify, you go round and round and make a square. Then you knit out from two opposite sides of the central square. Several false starts (I find starting a circular shawl in the center very hard to do, but worth it once you get going). I was right on schedule with the center. I chose to knit the two sides simultaneously using one circular needle, so I attached a new yarn to one side and continued on with my current skein on the other side. I continued on schedule. Then one day I revisited the pattern and took a close look at the line that said repeat 8 times. OH NO! I had read 1 time when I put together my schedule. Now to be clear, each pattern repeat consists of 20 rows with a center section that was repeated 6 times every row. Since I was working both sides simultaneously that doubled the amount of knitting – making the total number of repeats of the same 20 rows = 16 (we are talking 320 rows here). At this point I had to double the daily knitting. I kept to the schedule for two more days, but it was now October and I had lots to do other than knitting. I know, how could that be??!! I then hit my next roadblock – I had miscounted the number of beads I needed and I was way short! I can only say that I’m glad I noticed this in the middle of October and not two days before I was supposed to finish the shawl. So I got online and ordered more. But due to time constraints I had to order them 2nd day delivery – ouch! They arrived on October 17th. Panic is starting to set in. I really wanted to get this done before I left because I didn’t want to be carrying blocking wires with me on the ship. 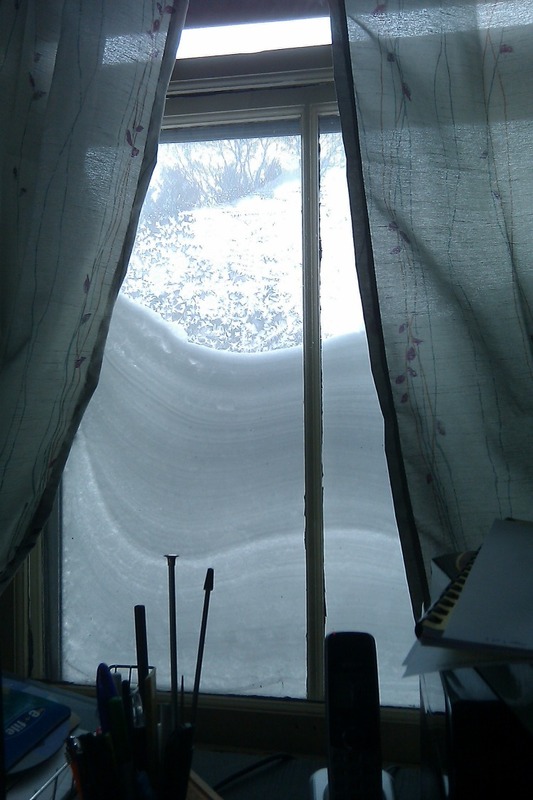 But, I had to pack, so…. I took it with me. And blocking wires too (I figured how many I would need and just packed those). They went in my checked luggage, with a slight bend. 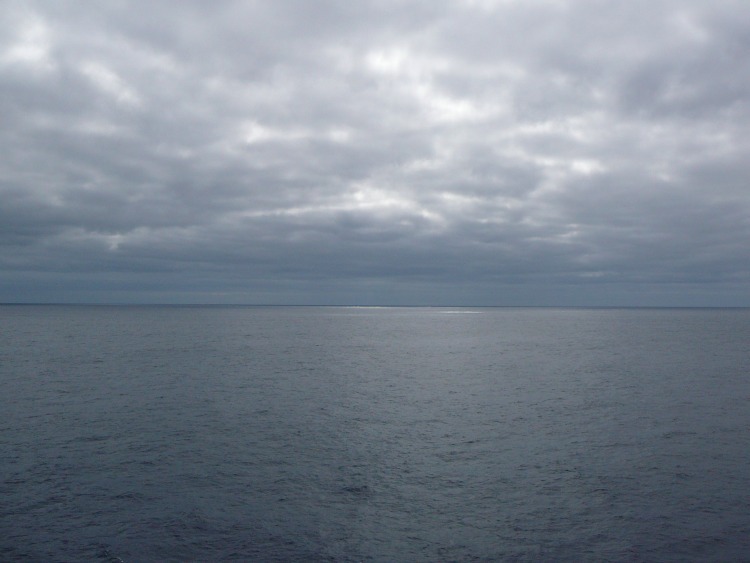 Believe me, when we boarded ship they were the first things I took out and put someplace where they could stand straight. So I knit and knit and knit. I knit in the airport. I knit on the plane. I knit in San Diego. It was now the 28th and I still had lots more to do. 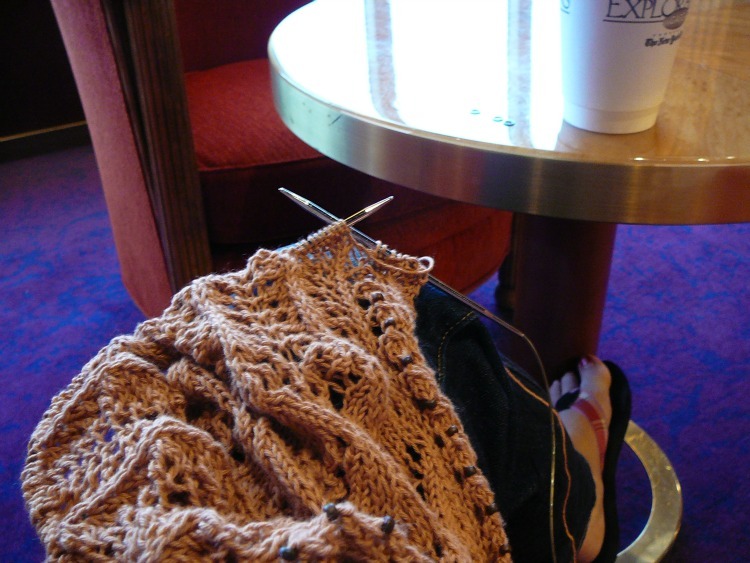 So for two days I would sneak off someplace on the ship with a cup of coffee and my knitting. In response to questions like: “What did you do today?”, I’d say rather vaguely, “Oh, just sat around in the lounge and read.” We, fortunately, had bad weather and rocky seas in the first few days, so the pool and the sun was not competing with my knitting for attention. I know striking colors – red upholstery on the couch and purple rugs. I meet a few other knitters (spell check wanted to change this to kittens, but I resisted). One who wanted to tap me as a guru to help her with her knitting if she got stuck. I never saw her again, so she either found someone else, or she needed no help. The other knitter was truly ambitious. Since the weather was cool, she started a bolero jacket right there on board and was hoping to finish it before it got warm. I saw her a few times after that, but never had a chance to find out how it went. She was a fast knitter, so maybe she was successful. One can only hope. 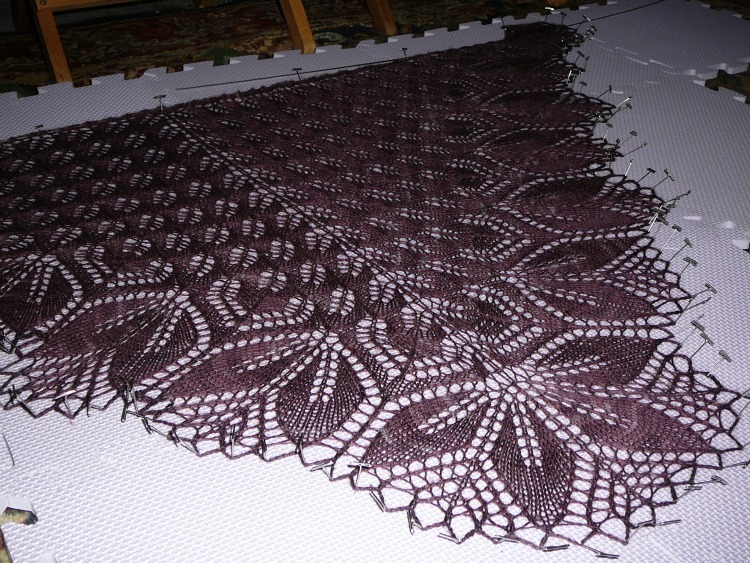 I managed to finish the shawl on the 29th of October. I washed it in the basin in the bathroom to our state-room and spread it out on the floor, taking liberal use of the towels they provided. I am rather proud of this shawl. In looking it over while I blocked it I did not see one space in which a bead was missing and all my yo’s and k2tog’s looked symmetrical. It came out very long (I think I measured it but I have no idea where I jotted the measurements down, if at all, so I cannot tell you how big it was). 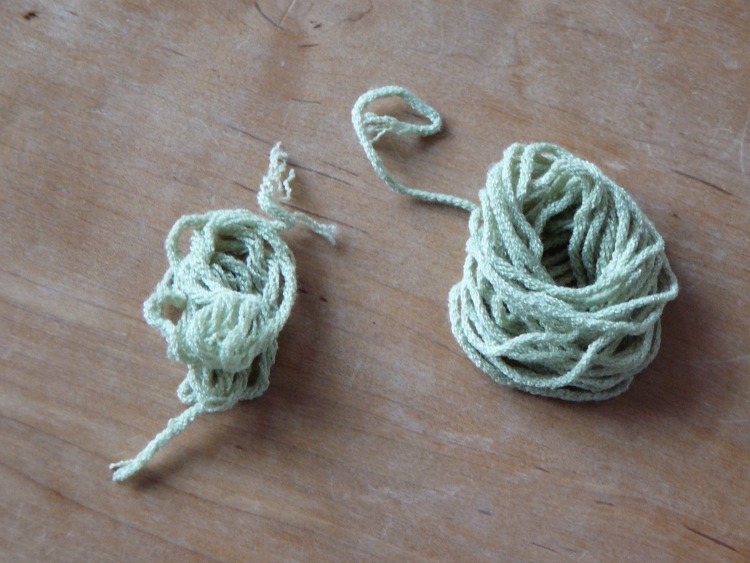 A word about the yarn: I am really sorry that it’s a discontinued yarn. I absolutely loved working with it and wish I had a garment made out of it. It was soft and smooth and very well-behaved. I think yarn companies discontinue yarns to keep us on our toes building stashes so that we don’t miss out – but that’s a topic for another day! Ravelry page. 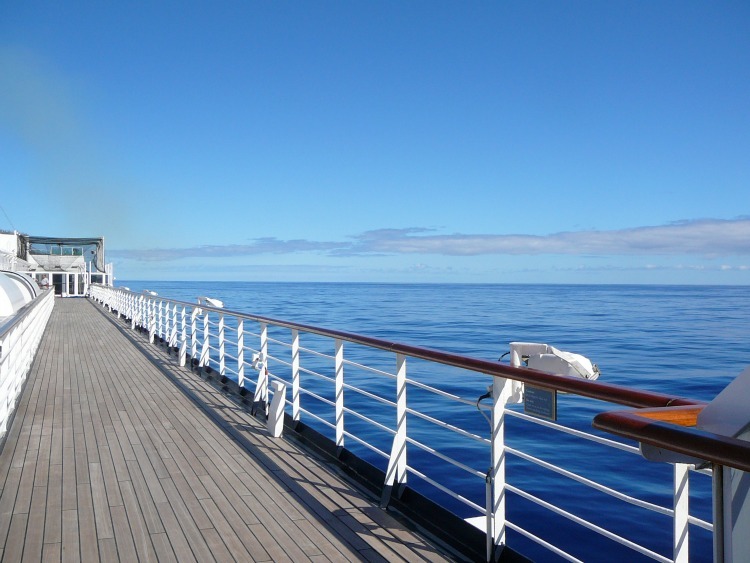 Well, I am glad I finished on time and once that was done I could actually enjoy the cruise and get some reading and sunning and swimming and eating done! Well, I’ve been sitting here with a bad, bad cold. 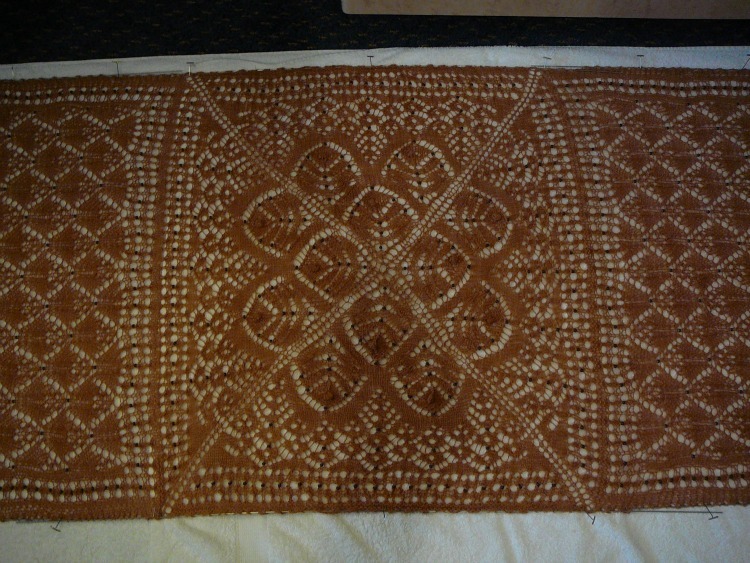 I decided that this is the perfect time to finish some long languishing projects. 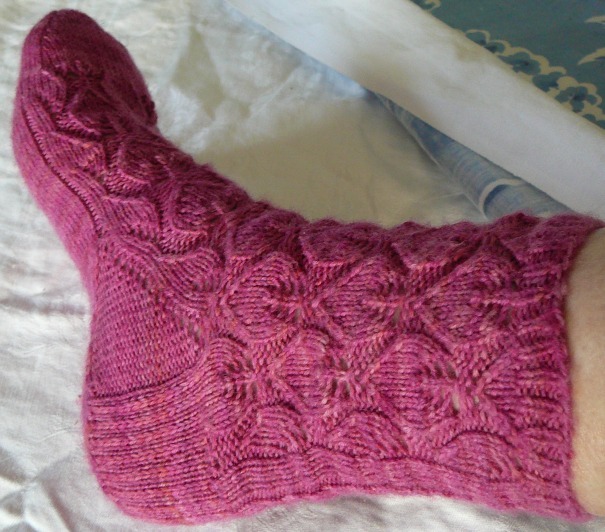 I started with Eunice, the second pair of socks in Cookie A.’s book: Sock Innovation. That pile on the right is 128″ long, but the pile on the left is only 33″ long. It was sort of an emotional roller coaster getting to the end there. One moment I felt confident I had enough yarn, the next that there was no way that there was enough yarn. Glad the yarn pulled through. You see the problem was two-fold, first the skein, instead of weighing 100 gm (as the label said), weighed only 96.1 gm. Thus, probably had less than the full 392 yds of yarn. Secondly, I added an extra repeat of the cuff pattern because I don’t really like short socks. Which, of course, used more yarn. All I can say is that fortunately, I have very small feet. Three on the front cable, one on the back cable. Knit 3 from the left needle, purl the one on the back cable needle, knit the 3 on the front cable needle. Not so bad, except when I had to do that cable on the sides of the sock, then stitches had to be moved from needle to needle. Now, Cookie A. uses dpns, I use two circulars and I knit two socks at once (I have to do that otherwise the second sock just doesn’t get done). I love my little ‘safety-pin’ like stitch markers because I use them to take stitches off one circular and put them on the next. 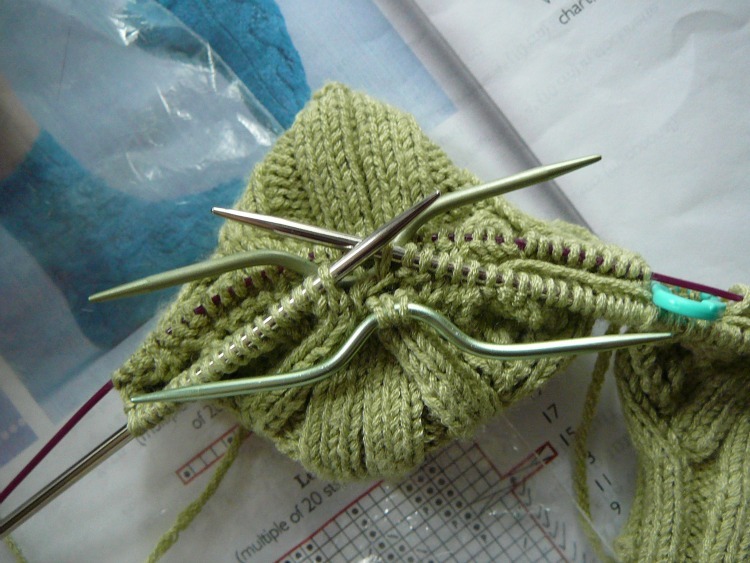 The safety-pin holds the stitch that needs to get transferred to the other needle, especially handy to use if the stitch is in between the two socks rather than at the end. A bit more about this yarn. It’s called Pediwick from Knit One Crochet Too. It’s a bamboo/nylon blend and a very nice soft yarn. However, it’s going to be trouble. Just while knitting it started to pill. I’m glad I made socks with this yarn and not a sweater or something. I do love the color, sage green is one of my favorites. And, as I mentioned, the socks are nice and soft. In fact I’m wearing them right now (kept them on after the photo shoot). Like I said, one down, two to go. 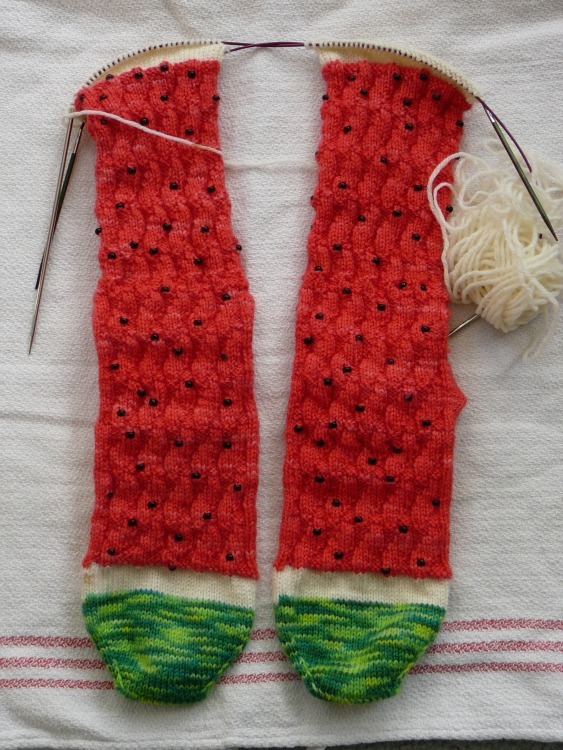 I will now finish the Watermelon socks that I also started in July. 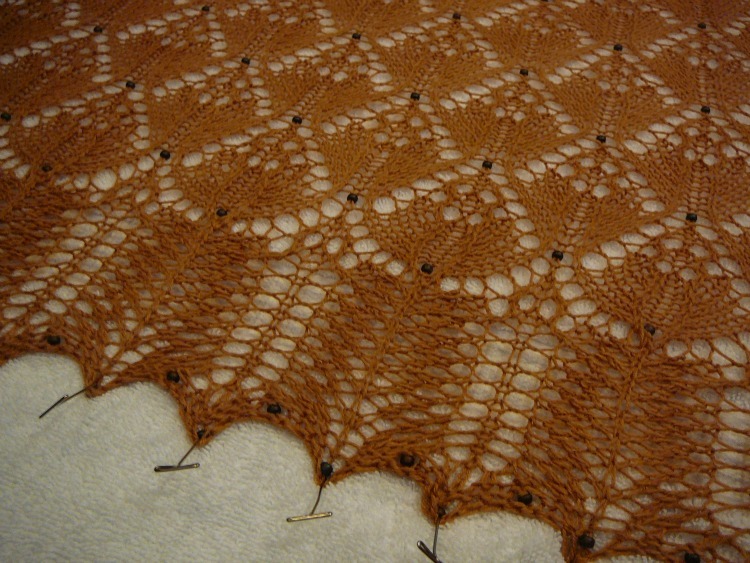 After that, I will finish the second Cardioid shawl. I just noticed that the two projects I recently completed and one that I am working on all use the leaf pattern in the design. I’ve been busier than I thought! I know it’s been a long time since I last posted, so long in fact that I forgot my password. Fortunately, I did what all the ‘experts’ tell you not to do, I wrote it down. Saved me the trouble of clicking – “Lost my password” or something to that effect. Lo and behold, I found a bunch of drafts of posts. I have no idea why I didn’t post them at the time, especially this one which is complete with photos. So you will be seeing a series of posts from me in quick succession, mostly of stuff I kept in draft. This post is from sometime in August! August 2012: I was looking back at some of my posts and I saw pictures of works in progress. I am very happy to say that they are both finished now! You can see the partially completed projects on this post. Now the Cardioid came out a nice size. I’m happy with it. I’ve hung it on figurine and that’s deceptive because she’s smaller than I am (especially because she has no arms – very helpful for displaying shawls, wouldn’t want to live that way). I’ve started a new one with larger needles and beads, I’m curious to see how it turns out. NOTE (added January 2013): I actually wore this on the cruise, at dinner. More on that cruise later, in another post. 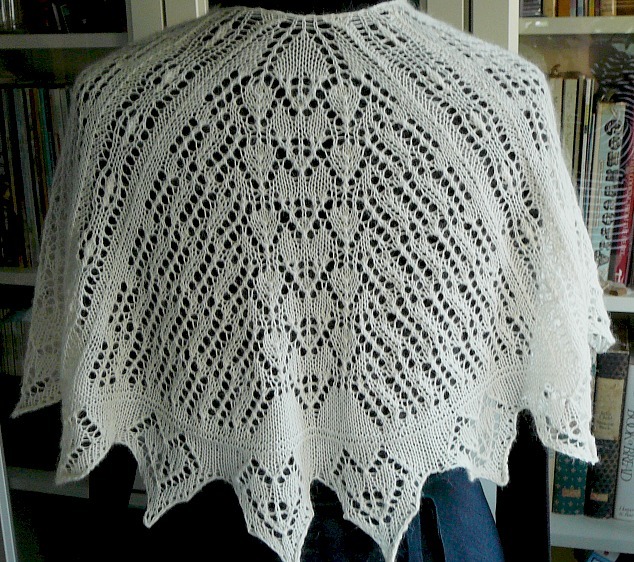 This is a wonderful soft shawl because the yarn was so great. But it came out small, I have that problem with triangular shawls. I tend to think that there is a lot of wasted knitted ‘fabric’ when you knit a triangular shawl. You have this piece that goes down the back and takes away from where you really need the shawl, over your shoulders. It will work well as a triangular scarf, especially here in New England, where sometimes it gets cold in the winter. As I was blocking this, I noticed a dropped stitch -huh? Must have done it while I was binding off. That’s the second time that’s happened. NOTE: January 2013: Yeah, and I still haven’t fixed that dropped stitch!